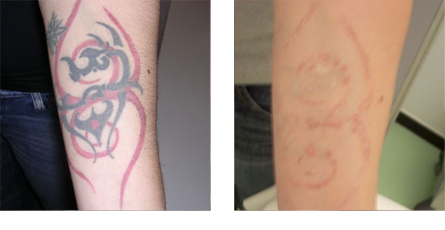 The ND:Yag Q-Switched laser is the only effective tattoo removal treatment for erasing unwanted tattoos or removing benign pigmented lesions without scarring. During skin pigmentation treatments photons of light are selectively absorbed by the tattoo ink or pigmentation (melanin). This sudden increase in temperature causes the ink/pigmentation structure to shatter. The body's own immune system removes the shattered pigment. This varies person by person. Amateur tattoos can usually be removed in 3-4 treatments with professional tattoos taking 6- 12 treatments. 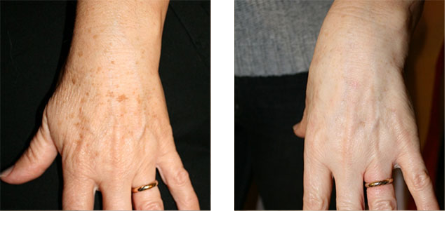 While skin pigmentation treatments can take anything from 3-8 sessions. 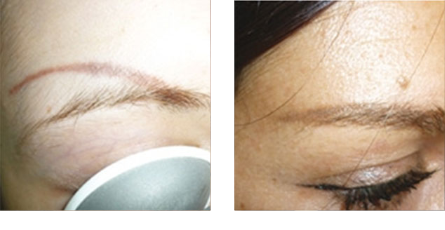 Tattoo removal treatment and skin pigmentation treatment are relatively painless. To ensure client comfort we use a “chiller” machine that blows cold air onto the area being treated to ensure no discomfort is felt. Every 4 - 8 weeks or until the skin is completely healed. Experience, expertise and the best equipment. 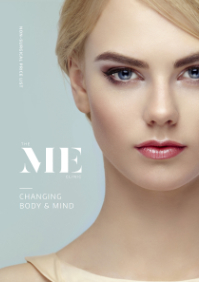 With over 30 combined years experience with laser treatments and in the advanced aesthetics field customers can be reassured that they are in the very best of hands. We offer tattoo removal treatment and skin pigmentation treatment to both male and female patients. 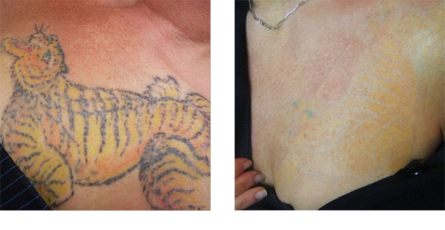 What happens after the tattoo/pigmentation removal treatment? Directly after tattoo removal treatment there will be some redness, the skin will appear to have white bubbles, and there will be a small amount of swelling. We will apply antiseptic cream and a dressing before you leave the clinic. We advise applying the cream twice per day for the 7 days following treatment. How will my tattoo look directly after treatment? Immediately after tattoo removal treatment your tattoo will look red, raised, swollen with white bubbles where the pigment has been shattered. This can last up to a week and can be followed by bruising. It is extremely important that you follow the after-care advice given by your practitioner. How will my pigmentation look directly after treatment? 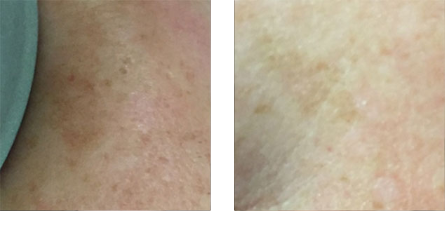 Immediately after skin pigmentation treatment your pigmentation will look 'frosted', be slightly swollen and red. The swelling can last up to 24 hours. The pigmentation will then scab over, it is extremely important not to pick or scratch the area as this could cause damage to the underlying new skin.